Learning how to prioritise work has to be one of the best skills for business owners to learn. Quickly. We often start a business because we have a talent or passion, and love doing that particular skill or interest, so focus our time on that. 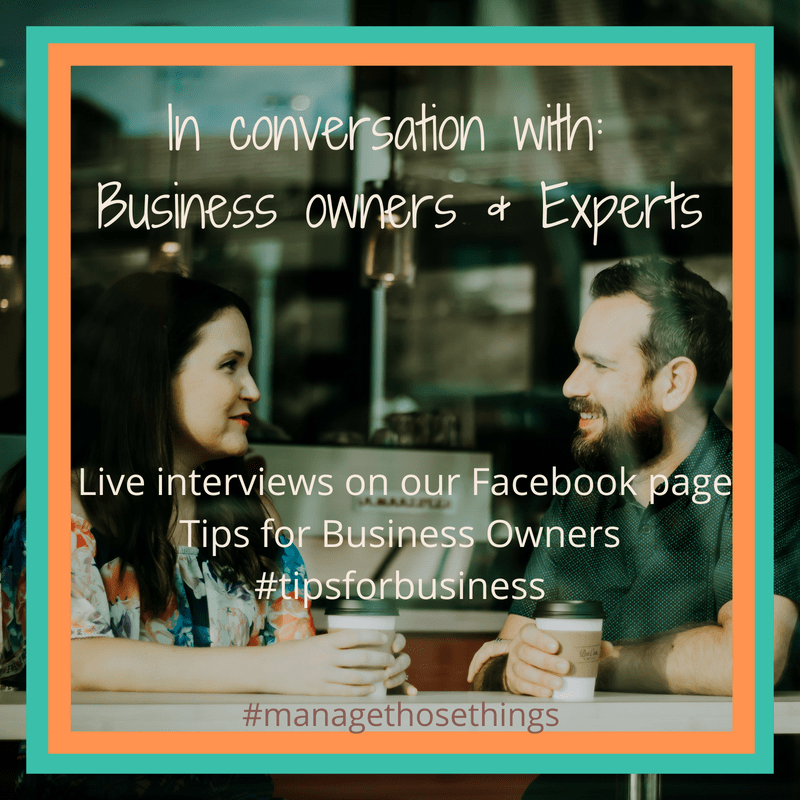 As we know, there are many areas of business we need to consider when we’re running our own show, so prioritising is a skill we have to put into action. Our boss isn’t going to tell us what they want us to do, it’s all down to us! 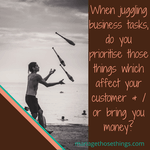 Many business owners are master jugglers. You’re the person who answers the phone, pays the bills, makes the product, goes to the post office, makes the tea, and orders the supplies. You’re probably the cleaner and tea maker too! When you’re working in your business, do you do things at set times each day or week? Or is there one long “to do” list, and you’ll start with the one you want to do, and work your way through the list somehow? Depending on your business, if you’re the only person dealing with customers, then you have to put them first. It’s not that “the customer is always right”, it’s simply because your customers are paying your bills, and giving you an income, (hopefully). Assuming you put customers first every day in your business, and you deal with queries, you create the product or service they want. What time have you got left for everything else on your list? Ok, so you’ve served your customers and made sure they’re happy and have everything they need. Now you’re left with x amount of time. What now? Check your list. What’s jumping out at you? Is it jumping out because it’s been there for 18 months and is finally getting a bit angry you haven’t done it yet? Or is it jumping out because it’s the next product you’re wanting to create for your customers? Or it’s an improvement to the call answering system that you’ve been meaning to put into place. A new system will save you time, and your customers will get better service. Can you see? Whatever is going to affect your customers experience, and/or future customer relations should be high on your priority list. The other things you need to think about, which do fit in with that theme, is getting money in, and paying bills on time. If your customers don’t pay you, you can’t pay your suppliers, and they’ll stop delivering, so you’ll have to stop making product. See? That’s how it works. So spending time on your finances is important. “What about marketing and social media?” I hear you cry. Yes, they’re important as they are maintaining customer relationships, and seeking out new customers. However, think about the time v income scenario. It always comes back to money! Without money, you have no business. So it’s important learning how to prioritise work. If you know your business numbers you’ll find it easier to prioritise your work and to do list. If you know how much time it takes to get a lead to buy something from you, you’ll know that you need to start x weeks in advance of when you need the income to generate new leads. If you know how much time it takes to create product, or deliver your service, and the income you’re getting from that, you’ll know your hourly rate. If you spend more time than necessary on social media, you’re reducing the time you’ve got to spend with paying customers. There’s all sorts of different ways to look at this. And it will very much depend on your business and your circumstances. If you’re in start up phase you’ll be spending more time marketing and communicating than you’ll need to as your business grows. (You may also get someone else to do some of this work to give you more hours in the day). If you have staff, or assistants you’ll be able to delegate tasks to them that other people can do, leaving you, the expert in your field to do the things that only you can do. Sometimes it’s simple to work out how to prioritise work, and other times all we can see is a long list with no end. Asking yourself some basic questions, mainly, “does it serve the customer” & / or “is it making money” will help you get really clear what your priorities are today. We’ve created a 5 day planner which will help you get really clear on your priorities. It’s free to download, but we just need your email address to send it to you. If you fill in the box below, then confirm we can send it to you, it’ll be in your inbox & ready for you to use in no time. Hope it helps? Can you tell us how to prioritise work in a different way? Care to share? Let us know below in the comments.